Just About Anything: Finally, Some Tulips! Let this hot-colored tulips brighten up your day! Me and some more tulips! This is my favorite photo. Tulips never cease to awe and inspire me. Their beauty is just so graceful and they seem to reach up the sky. 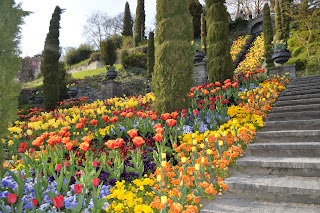 The Italian Steps is a stair of flowers with spring water flowing from the top of the steps. It was beautiful and cheerful with all the colorful mix of yelllows, oranges, and reds. A view of the Italian Steps from below. wow! is it just the camera? of course not! mura na ka professional photographer k ai..i think u should consider a career move...heheheh.. 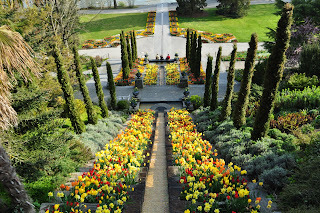 I went to Insel Mainau years ago. You have reminded me of how beautiful it was. And you have captured those aspects of it beautifully. wow, marce! ka ganda naman nyan. i love tulips too. hay. sarap naman jan.
toinks. bat mo niwala SD mo. waaaaah! ako din iiyak pag ganun. shet. kaya lagi dapat may backup hihi. Belated Happy Mom's Day sis!